School lunches are about to improve! Over 31 million children in American schools will have a chance of a better school lunch as the Healthy, Hunger-Free Kids Act (S. 3307) passed today. “We know that our food system is broken when the food we feed our children will cause one in three to develop diabetes, and when obesity levels are at an all-time high. This Bill is far from perfect, and has involved large compromises, but is a great achievement towards our end goal of making kids healthier,” he continued. Although many schools have been able to switch their lunches to healthy, organic, locally-grown meals, the majority of school children rely on meals that are laden with high fructose corn syrup (HFCS) and other additives. For instance, children at my school are regularly fed apple sauce with HFCS. Sure, apple sauce may look like a healthy addition on the menu to a meal of tater tots and ketchup (which is counted as a fruit in menu planning); however, the addition of HFCS is unnecessary and dangerous. Many school children rely on the free and reduced lunch program that is federally funded. These children’s diets are already at risk from poverty, and they especially need nourishing, whole foods at school to help them learn and grow mitigating their home lives. Directs the Secretary to establish a pilot program awarding competitive grants to school food authorities to increase the quantity of organic foods provided to children under the school lunch program. Gives grant preference to school food authorities in districts where greater than 50% of the households are at or below the federal poverty line. Authorizes appropriations for such program for FY2011-FY2015. 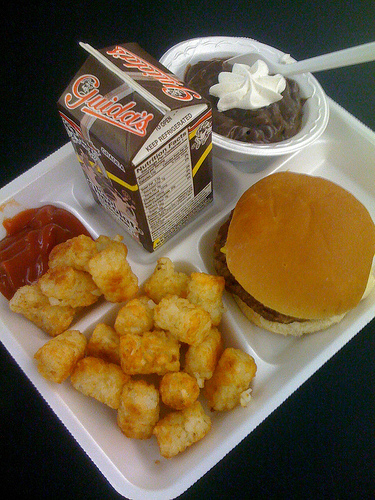 Replaces the farm-to-cafeteria program with a program providing schools, state and local agencies, Indian tribes, agricultural producers, and nonprofits with competitive matching grants and technical assistance to improve access to local foods by schools participating in the school lunch or breakfast programs. Gives priority to projects that: (1) make local food products available on school menus; (2) serve a high proportion of children who are eligible for free or reduced price lunches; and (3) incorporate experiential nutrition education by involving school children in farm and garden-based agricultural education activities. Authorizes appropriations for such program for FY2011-FY2015. Authorizes appropriations for FY2011-FY2015 for the pilot program for high-poverty schools, which provides grants to nonprofit or public entities to develop and run community gardens at high-poverty schools to provide students with hands-on vegetable gardening and nutrition education. It’s interesting that S. 3307 gained unanimous support in the Senate, but the House was divided by 264 Ayes to 157 Nays (13 no votes). Did such decisiveness result from midterm elections and anti-Obama sentiment? If so, it is a shame that once again, politics is interfering with our children’s health. The president is expected to sign the bill into law. To think, some day I may actually be able to allow my children to eat a school lunch! We have to improve the school lunches. I’m a teacher. If I eat the school lunch, I’m sick for several days. Section 205 of the bill could fundamentally change the structure of the program, damage its effectiveness and reduce participation. It is dissapointing that the bill is funded by cuts in the SNAP program. This seems fundamentally wrong.